The Vixen AXD2 mount comes with Star Book Ten controller for manual or computer controlled observation or astrophotography. 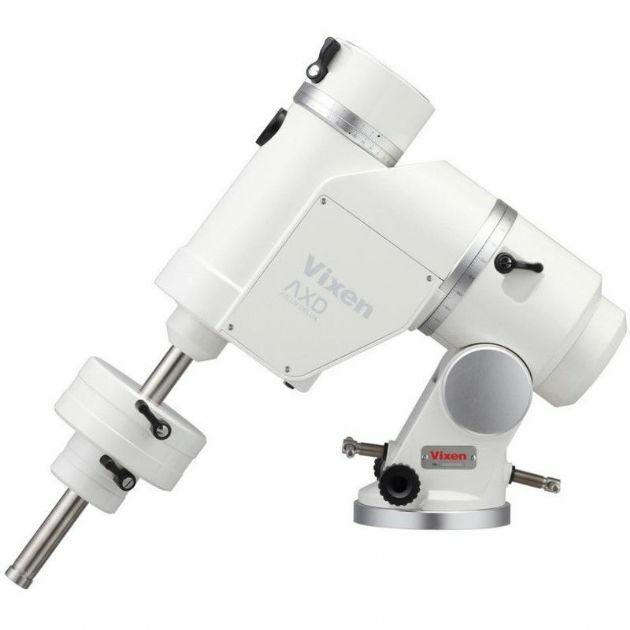 The new AXD2 mount is the latest generation of Vixen’s renowned Atlux equatorial mount series. The Atlux Deluxe (AXD) has been engineered to cope with the demands of the most advanced astro photographer. As digital camera resolutions have increased, so has the need for more accuracy and stability in an equatorial mount. The use of multiple high precision bearings, worm gears and drive components mean the AXD2 is perfect for long exposure and very high resolution astro photography. A new feature to the AXD2 mount, is the PF-L Polar axis scope. This uses a three star alignment process with an adjustable illuminated reticule and now comes as standard with the AXD2 mount. Other new features include the tracking precision. The periodic motion of the AXD2 has been improved from +/- 3.5 arc seconds to a guaranteed tracking rate of +/- 2.8 arc seconds. Lightweight but strong A7075 aluminium alloy is used for the construction of the RA and DEC axes on the AXD mount. This material is stronger than titanium but is also 38% lighter. This helps to keep the overall weight of the mount head down to a transportable 25kg. The RA axis shaft is 50mm in diameter which is 20% larger than the previous generation Atlux mount and so offers higher payload capability. The brass RA worm gear has 270 teeth which again represents an improvement over the previous generation and means better accuracy in tracking. Stepper motors control the rotation of the gears at all speeds using Vixen’s unique micro-step motion control system. This system delivers 400 pulses per second to the motors and eliminates the need for numerous reduction gears in the motor gear train. As a result, backlash is significantly reduced. The stepper motors used in the AXD have sufficient torque to slew a payload of 30kg (66lb) at up to 800x sidereal rate. The RA and DEC motors are placed in the lower part of the declination body, following the design that has been so successful in the Vixen SX mount range. This brings the centre of balance of the declination body below the cross-over point of the two axes. As a results, the motors effectively become part of the mount’s counterweight package, reducing the amount of additional counter weight required for a given payload. Vixen Periodic Error Correction (VPEC) means that each and every AXD is factory tuned with a permanent periodic error correction table stored on the mount’s internal memory. In addition, user programmable PEC can be applied separately to both RA and DEC axes to further improve tracking performance. The latest version of the Star Book TEN firmware includes a ‘moon map’ function. This allows the user to call up an on-screen map of the visible portion of the moon. Major sites of interest on the moon’s surface are highlighted and can be selected for the scope’s GO-TO function. The polar scope PF-L with built-in dark field illuminator is supplied as standard with the AXD2 mount and is mounted in the RA body. Vixen’s excellent reticle design and precise RA axis/polar scope alignment allow for precision polar alignment. No hour angle setting is required, making set up quick and simple.